Baltasar GarzÃ³n portrait for Monocle Magazine. I’ve wanted to shoot for Monocle Magazine for a long time, so it was great to finally get this opportunity. 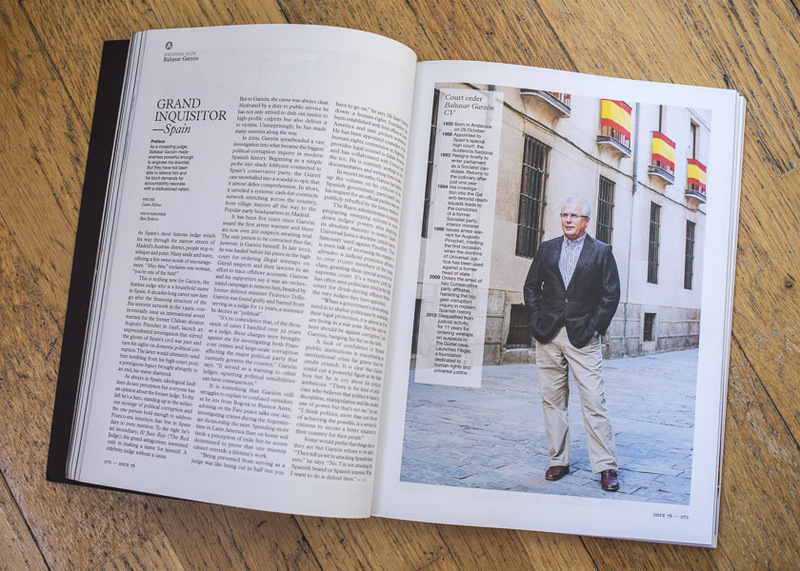 I teamed up with the magazine’s Spain correspondent Liam Aldous, spending a morning with the controversial former high court judge, Baltasar GarzÃ³n. Well known in Spain for investigating political corruption, GarzÃ³n is known globally for issuing anÂ international warrant for the arrest of formerÂ ChileanÂ PresidentÂ Augusto PinochetÂ for the alleged deaths and torture of Spanish citizens. It was an interesting experience walking the quiet morning streets of Madrid alongside GarzÃ³n. AÂ highly recognisable and divisive figure, a number of passers by were compelled to speak to him – ‘You’re one of the good ones’ said one lady. Monocle ran my image full page in the September 2014 issue alongside Liam’s interview, for the magazine’s ‘National Icon’ section.